The Eco High Bay Series is a cost-effective and quality solution for lighting warehouses, distribution centers, manufacturing facilities, big box retailers, and other industrial applications. A dimmable and compact product made of galvanized steel housing and white electrostatic powder coat finish, it delivers a high lumen output to replace both 4 or 6 lamp T5HO fluorescent highbay or 400W HID highbay fixtures. 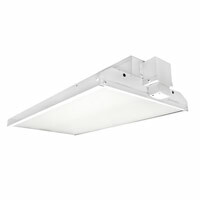 Cable, pendant and surface mounting options enable the highbay to be customized to meet virtually any lighting requirement.